There's a reason Apple designed a custom chip to make Bluetooth pairing easy, and the VerveOnes+ are the absolute example of the problem that needing fixing. Now that completely wire-free headphones are a realistic product, many companies have jumped on board the bandwagon. Apple, Samsung and Jabra joined the likes of Bragi in the relatively new market, as has Motorola with its Verve Life lineup. As designs go, the VerveOnes+ are eye-catching. The chunky two-tone black and orange teardrop is built entirely from plastic, with a circular button on the outside. Like almost all other completely wireless earphones on the market from the likes of Jabra, Bragi and Samsung, there are contact points built into the surface of the ear buds for charging the internal batteries when placed inside the carrying case. Bragi Dash review: The sound of the future? Credit goes to Motorola for the design of the case as well. It may not be as neat and small as the Apple AirPods case, but the rotating action for opening and shutting it is pleasing. The same can't be said of the insertion and removal of the earphones from their cradles though: rather than use magnets to keep the earphones in, Motorola has opted for tiny latches that clip onto matching indents in the sides of the earphones. While it's not exactly difficult to place them in their spaces, or remove them, it's not as easy and convenient as it could be. It can be fiddly. Saying that, once the VerveOnes+ are placed in the ears, they're easy to wear and relatively comfortable. The plastic casing is coated in a grippy finish to ensure that they won't fall out easily, and despite them sometimes feel a little off balance, they don't become dislodged at all. If the initial fit isn't right, there are small, medium and large silicone ear-tips in regular single form and with the popular double-flange design. As well as being easy to wear and secure, the VerveOnes+ are IP57 certified, meaning they're water- and dust-resistant to high levels, their internals have also been treated with a special coating to keep them protected from moisture. In real life, that means you can use them on your sweatiest workouts, and the earphones survive through them. IP ratings: What do these water- and dust-resistant numbers actually mean? In theory, connecting the VerveOnes+ to your phone should be very easy. All that's required from a user standpoint is to remove the headphones from their case, put them in your ears and go into your phone's Bluetooth menu to pair them. Except, in reality, it's not so simple. In our setup process, we selected to pair the earphones with an iPhone and watched it disconnect and reconnect a few times every second. We then placed them back in their case, told the iPhone to forget the device, and started again. Thankfully, the second time, it stuck. Then came pairing the Hubble Connect app with the earphones, which was a separate process. With the app, you need to place the earphones in the case, slide it shut, then open. Once connected you can see the last known location of the earphones, adjust equaliser (EQ) settings and check battery levels for both earphones. The bizarre part here is that you can't connect using the app while you're using the earphones for listening to music. So you can't adjust the EQ from the app and hear the differences in real-time. If you want to use the app, you have to put them in the case, open the app, choose a preset EQ balance, then put them back in your ears and listen to see if you like it. You can use the single button on either earphone to switch EQ presets as well. Just press-and-hold it to hear which preset it is, press-and-hold again to hear the next preset, then single click to choose that one. It's not exactly intuitive, but it saves clipping in and removing them from the case multiple times. Both methods of choosing an EQ preset seem counter-productive. Once in the ears and connected we found the Bluetooth experience was rock solid (tested when paired with an iPhone). Even going out for a run with our phone strapped around our waist it proved no problem for the VerveOnes+ - there wasn't even the slightest glitch. While other manufacturers' earphones have multiple controls, the Motorola pair only have a single button on each ear, with both sides performing the same function. One press will start or stop the music, while a long press takes you to the EQ preset settings. Once you're done listening, you place the VerveOnes+ back in to the carrying case, then they're supposed to automatically disconnect from the phone, but sadly that wasn't always the case. Even when clicked in to place, sometimes we found that the audio connection was still active and audio was still playing through the earphones. Most days, putting them away also meant going into the Bluetooth menu and manually disconnecting. You can set them to automatically stop the music as soon as they're out of your ears, using the app to toggle that setting, although again it didn't seem to work consistently. As for the earbuds' built-in batteries, we got down to 75 per cent after listening to about 30 mins of music, suggesting a playing time of around two hours without needing to be stuck back in to their cradle. Combined with the battery pack in the case that recharges the earphones, Motorola claims up to 12-hours of playback from the VerveOnes+. That's around six full recharges then. Down to one of the most important features: sound quality. The VerveOnes+ are certainly decent enough to listen to for a few hours. They could be criticised for being a little bass heavy, but having a lot of bass driving the tunes while you workout isn't necessarily a bad thing. Critical ears might find them a bit too muddy sounding. The main sound issue we had was sometimes a hissing, or similar noise which we only noticed during quieter songs, or during the more sparse breakdowns in our favourite tunes. It wasn't constant. But if you're using the earphones for workouts, it's not likely to bother you at all since you won't notice it. As mentioned previously, there are some EQ presets to choose from which alter the profile of the sound. So if you want even more bass, you can select the "Bass" setting. Less bass, go for the "Balanced" setting. None of the EQ presets are especially clear though. The most balanced and clear setting is "Brilliant" which does a decent job removing the muddy tendencies of the other presets and is the only one with any ring. The VerveOnes+ are the epitome of why Apple designed a custom chip to make Bluetooth pairing easy in its AirPods and new Beats X earphones. The Motorolas have a temperamental pairing experience, along with unreliable auto-disconnecting when placed in the case. However, the Motorolas also offer a more snug fit and better sound. At their original price point of £229 the VerveOnes+ are difficult to recommend, considering how solid our experience was with the similarly priced Jabra Elite Sport, but their current £179 price tag (on Amazon) keeps things competitive. 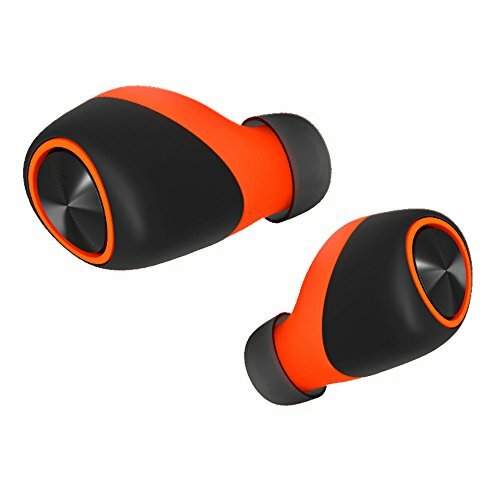 Especially for wireless in-ears that are loud and bassy enough to help you keep driving on during those workouts. The Jabra Elite Sport have been the outstanding performers of the completely wireless earphones we've tested so far. They offer a rock solid connection, to each other and the phone, and sound good too. Perhaps the only thing to be careful of is to always keep the carry case battery charged, the Jabras don't disconnect from your phone unless they're placed in a non-depleted case. You can buy them from Amazon UK for £229, or from Amazon US for $249. AirPods make the list of alternatives for being, without doubt, the most convenient pair of earphones on the market for iPhone owners. They connect without any of the usual old-school Bluetooth problems, thanks to the W1 chip, they're small, light and reliable. Read the full review: Apple AirPods review: Wire-free future or design disaster? You can buy AirPods from Apple in the UK and US for £159 and $159 respectively. They may not be the most tech-packed pair of headphones around, but The Headphone by Bragi is both cheaper and more reliable than the more expensive pair from the same manufacturer. In fact, if you can live without the water and dust resistance, and without a battery pack in the case, The Headphone is a relatively safe, affordable recommendation. The Headphone is available to buy direct from Bragi for €169 in Europe, or $149 in the US.